Congratulations to Andrew Haysom for winning the “Best Apprentice in a Large Business” award at the recent Newbury College Apprenticeship Awards held at Newbury College. Andrew is very proud of the award and is seen here by his milling machine with his award and certificate. Well done Andrew, a fantastic and well deserved achievement. Andrew started his four year apprenticeship in September 2016 and has now completed his factory tour, during which he has spent time in all the various manufacturing departments. His focus now is in the milling department where he is mastering both manual and CNC milling along with manual turning duties. 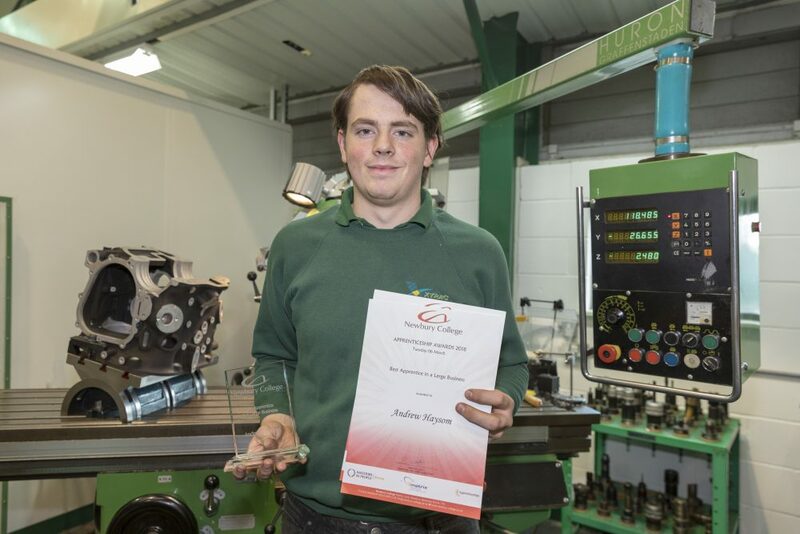 The award from Newbury College follows closely behind the recognition that Andrew received in the South East regional EEF Future Manufacturing Awards in November 2017, where he won the Intermediate & Advanced First Year Apprentice Award. Reflecting on his achievements to date during his apprenticeship, Andrew has a desire to assist with the training of future apprentices at Xtrac. Chris Marrs who is a fourth year apprentice and now working full time in the Quality department was also nominated as “Best Apprentice in a Large Business”, and Apprentice Manager Warren Page, was runner up in the “Best Assessor” category. Well done to both Chris and Warren, with Warren’s award a fitting recognition for the years of work and dedication that he has put in towards making the Xtrac apprenticeship scheme what it is today. Xtrac’s award winning undergraduate and apprentice schemes grow each year with the 2018/2019 intake already closed for all positions except for the Operations Industrial Placement which has a closing date of 27th April 2018. Andrew Haysom with his Newbury College Best Apprentice Award. Apprentice Manager, Warren Page with the Xtrac’s 2017/2018 first year apprentices Daniel, Louis, Joshua and Stephen.